With the MiRx Protocol, you can avoid the complications or potentially dangerous side-effects associated with long-term use of prescription medications or OTC painkillers. The MiRx Protocol is even safe for use on pregnant patients. This is a total treatment plan for headaches & migraines. The MiRx Protocol has been clinically proven to provide long-term results with instant migraine and headache relief. Some patients can experience lasting migraine relief after just one treatment, but those who have experienced chronic migraines or headaches for years may require the full treatment program for maximum benefit. Stopping the Immediate Headache Pain is Good… Stopping it Forever is Life Changing! The MiRx Protocol is a treatment program designed to alleviate headaches, facial pain, and head pain. The protocol is made up of two critical components. The first stage of treatment stops the reaction of the nervous system and alleviates the headache pain. This is the fast-acting nasal spray (and revolutionary applicator) that targets pain relief right to the nerve source behind the face, which is the cause of many types of headaches. This initial treatment is referred to as the medical component. The second stage of the MiRx Protocol treats and rehabilitates the underlying condition, which is the physical component. 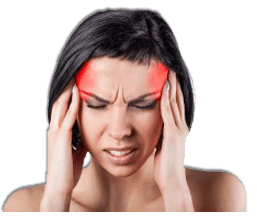 The physical component of the MiRx Protocol evaluates the diagnostic test results and your feedback to find biomechanical imbalances or other physiological conditions that need to be addressed for long-term headache pain relief. These are commonly referred to as triggers. This could include but is not limited to, physical rehab, chiropractic adjustments, corrective ergonomic recommendations, cranial therapy, diet modifications, and stress management therapy. Call today to alleviate your headache and migraine pain and get your life back!